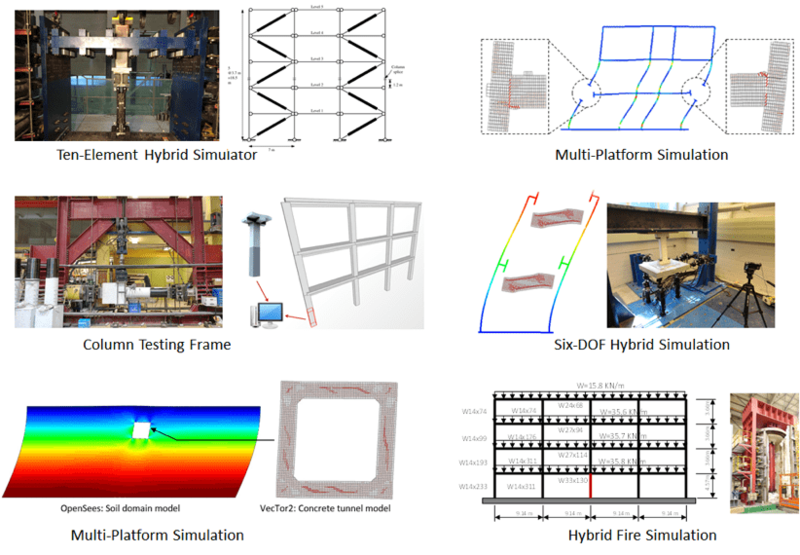 ​The University of Toronto has been developing and implementing a simulation framework (UT-SIM framework) which integrates various structural analysis tools and experimental specimens for pseudo-dynamic (PsD) hybrid simulations. A standardized and extensible data exchange format and communication protocol has been developed which can be consistently used in structural analysis software or an interface program for actuator controllers. In addition, substructure elements or communication routines have been developed for various programs such as Abaqus, OpenSees, VecTor, or actuator controllers. The UT-SIM framework has been used for various PsD hybrid (experimental-numerical) simulations as well as multi-platform simulations. Details on the UT-SIM framework can be found on this website. Some of the application examples are shown below. The proposed workshop is intended to provide hands-on training for PsD hybrid simulations to researchers looking to develop such simulation capabilities using the UT-SIM framework. Hybrid simulation methods have been actively investigated in the past two decades. Yet, implementation of a hybrid simulation method in a testing facility without any prior experience is still a daunting task as it requires understanding on various aspects of structural testing and numerical modelling. After training at the workshop, the participants will gain sufficient knowledge to start implementing hybrid or multi-platform simulation at their institutions. For technical questions, please contact one of the workshop organizers below. Department of Civil Engineering, University of Toronto, Canada.